For the second day, Great Blue Herons have aggregated in Roberts Bay to feed on a “run” of small fish, that at long range, appear to be a species of Surfperch – perhaps Kelp Perch. Maybe its a spawning aggregation. At noon there were 37 gathered, near maximum numbers recorded ( 46, I think it was). It’s interesting that their aggregation is so intensely concentrated around a particular spot on the mudflats, directly off “Cockle Point” ( between 3rd and 5th Streets). This is not the usual location where they fish, nor does it involve the same prey species, or hunting technique. Typically in June or July, depending on lunar cycles, such aggregations occur when they are hunting spawning Gunnels in the “Gunnel Patch” off the end of Third Street. Gunnel hunting requires more stalking whereas the Sufperch technique involves standing still and upright. 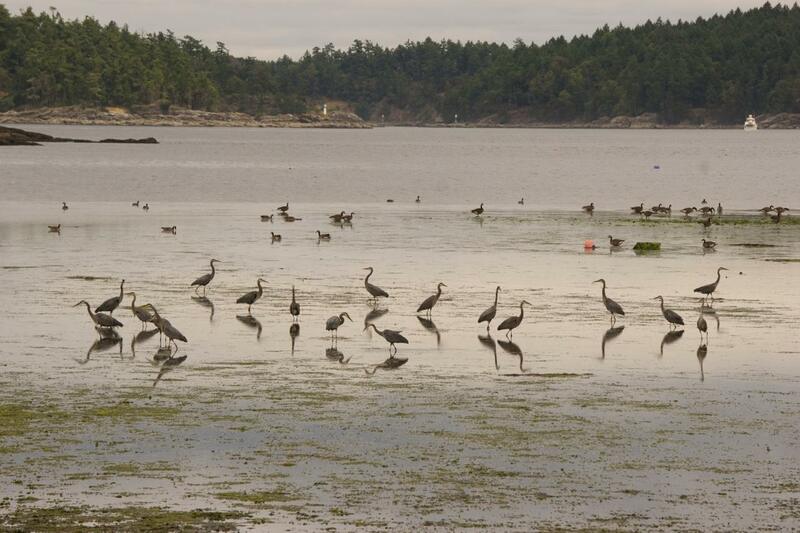 The warm, estuarine waters of Roberts Bay provide productive and diversified habitat for a diversity of schooling fishes, that support the herons, kingfishers, ospreys and cormorants. It takes a lot of fish to feed 37 Great Blue Herons and their growing families. It’s remarkable that they exchange knowledge of just where and when the conditions for optimal feeding occur. When Great Britain ( on behalf of Canada) signed the Migratory Birds Convention with the United States in 1916, both parties hoped to end market hunting and embark on a broad policy of “insuring the preservation of such migratory birds as are either useful to man or are harmless.” The subsequent endorsement of the convention by the parliament of Canada created the need for an enforcement agency with a strong scientific base. Today we know that agency as the Canadian Wildlife Service, but it was originally called the Migratory Birds Protection Office – a unit of the National Parks Service, headed by J.B. Harkin. In 1920 James A. Munro was appointed as sole Migratory Bird Officer for the 4 western provinces. The addition of J. Dewey Soper in 1928, and Robie Tufts in 1933, allowed the division of the country into regions, and Munro was able to concentrate on British Columbia until his retirement in 1949. The decision to devote a large portion of the Migratory Bird Office’s resources to British Columbia reflects the widespread unpopularity of the the above mentioned legislation. It was not approved by the provincial government until special privileges, particularly the spring hunting of Brant, were guaranteed.